* Upon receiving your payment, you will be emailed a link. Do keep in mind there could be a time difference between your location and Canada, but as soon as the day begins, links a are sent out as fast as possible. Finally it's available again. This time as a digital package. And it's a blast ! 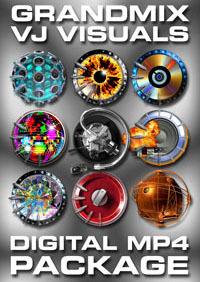 The Digital Package contains many extra visuals including animations made from artwork made for recent Grand 12 Inches, Grandmix 2006, 2007, 2009, 2011 and 2013. 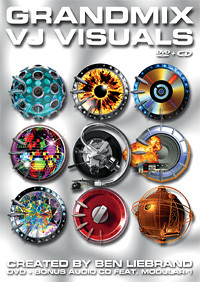 The original DVD is no longer available, but this is the content of the digital DVD files which are included in this digital package. Each animation has it's own chapter for quick access and the DVD starts directly without the delay of unnecessary menus. As a bonus, the video-clips Ben has made for Atlantic Ocean, Alan Parsons Project and Dadara are added to this DVD. Quick start DVD without anoying notices or slow menus. Each clip can be accessed quickly by it's own chapter, 88 in total. Other features are accessed by pressing the menu button. CD : Standard Audio CD with One hour version of Modular-1 a played on Armin van Buuren's "A State Of Trance" Radio Show, plus 14 minute Club Version. Images were created using Electro-GiG 3D animation system, Softimage 3D extreme. Rendered on Silicon Graphics Computers, one of which is the 16 processor Origin 2000 shown here. This rack which looks like it's as big as a large refrigerator is in fact as big as a large refrigerator.